Congratulations to the winner of our April Funny Fishing Photo Caption Contest, Krisoula N.
﻿﻿ To see all the entries, click here. If you've got a funny fishing photo which you think needs a good caption, please send it in. 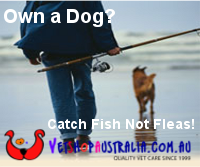 Planning a Trip to South Australia to Fish?